If you’re big into bulk shopping because of the long-term savings, you may want to invest in a vacuum sealer to stretch your dollars even farther. 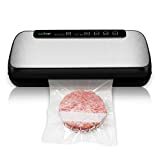 For those who are unfamiliar with the concept of vacuum sealers and what they do, vacuum sealers are simply as useful devices designed for sealing and preserving food products and household items. By suctioning out all the air from the bag or canister, you are removing all the oxygen. Refrigerated foods that are exposed to oxygen rot at a much faster rate. Many vacuum sealers say that they extend the shelf life of foods by five times that of conventional storage methods. That means the 10-pound bag of chicken thighs can be divided up into individual servings and vacuum sealed in separate bags and tossed into the freezer. When you’re ready to cook them up, just take out the number of bags you want. That way you’re not having to open up one large bag and exposing the rest of the meat to air. The rest remain vacuum sealed until you’re ready for your next chicken dish. As the name suggests, this device creates a vacuum by sucking out the air from enclosed spaces such as bags, jars and canisters in order to keep the sealed product in an airtight environment. A vacuum sealing device is very versatile in its usage and can be used for a number of purposes. Vacuum sealing can keep your food fresh five times longer than conventional storage methods. During the vacuum sealing of food items, this machine removes air and extra moisture which can lead to early spoilage and mold growth. Vacuum sealers can be used for short and long term food storage needs. This device can be used for heat sealing select portions of meat, poultry, fish, and some fruits and vegetables for long-term storage. But vacuum sealers aren’t just for food. You can pack your silver jewelry and silverware in vacuum sealed bags to save them from tarnishing and losing their luster. For important documents, vacuum seals preserve the paper from deterioration. That means important documents like birth certificates and marriage licenses won’t tear or yellow. A special vacuum port provided in some models of vacuum sealers even allows you to vacuum seal jars, canisters and large vacuum bags. Reduce bag making steps by 50%. Pre-Sealed Bags. Retractable Handheld Sealer. Rapid Marinate Mode. Retractable Handheld Sealer. Moist/Dry food settings for optimal sealing. Rapid Marinate Mode. Easy and Convenient Operation. Portable Size with Super Air suction. PERFECT FOR SOUS VIDE COOKING! A double seal on each bag. Customizable vacuum and seal methods. Сan vacuum package liquids. This type of vacuum sealing device is designed for commercial and industrial usage but can be also used for household purposes. These devices are bit more expensive than external vacuum sealers. These vacuum sealers have more capacity to remove air as compared to the nozzle or other out-of-the chamber sealers. The main difference between a chamber sealer and an out-of-chamber sealer is that the package to be sealed goes through the vacuuming and sealing process inside the chamber. Before buying a vacuum sealer, make sure you do your homework. If you only vacuum seal occasionally, you won’t need a commercial sealer. A hand held one might just do the trick. 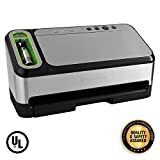 But if you like to vacuum seal throughout the day, pricier vacuum sealers that can double as small commercial devices and work horses at home are your best choice. Consider these points before making a decision. Read my vacuum sealer reviews, and decide which one to choose! Depending upon the technology used and the design of the vacuum device, prices can vary greatly. Some of these devices can be very expensive because of their high-quality materials and superior capabilities. They can handle vacuum sealing throughout most of the day. They can cost a few thousand dollars but are perfect for restaurant chefs or serious at-home cooks. Or if you big into bulk shopping or you have a clothing business, these machines are for you. For example, say you sell clothing online. By vacuum sealing the clothing before shipping, you are saving a lot of money because clothes that have been vacuum sealed take up much less space than clothing that has not. You will be amazed at how much space you can save by vacuum sealing your clothes. If you opt for a chamber sealer, chances are you may have to shell out more money than you would if you were to buy an out-of-chamber device. Are you a new user? And do you consider yourself a bit technically-challenged? Then consider an automatic machine that just requires you to fill the bag and place it inside the vacuum channel. The machine will do the rest. The ones that were designed for simple vacuum sealing are the most intuitive. Read the simple manual and you’re pretty much assured a no-fuss experience. Some of these devices contain all the materials required for starting vacuum sealing operations. However, if you are familiar with the functioning of vacuum sealers, then you should opt for a high-end machine that allows the manual adjustment of air levels to be removed so you can pack your bags or containers as required. It’s all depends on the amount of vacuum sealing you plan to do and how much you are willing to learn how to use machines with more complicated functions. Different vacuum sealers offer different capabilities and functions. Chamber sealers are more efficient but take a longer time to seal a bag as compared to out-of-chamber devices. The out-of-chamber sealer provides the user with more control and is easier to use as compared to chamber sealers. Models should be selected depending on the quantity and the quality of the material to be sealed on a regular basis. If your packing requirements include sealing food or other product on a large scale, then you should opt for commercial type sealers. The seal faster and were designed and built to handle a greater workload. Additional factors to consider when choosing a vacuum sealing device are the materials that are included in the packaging, what hand held accessories or attachments are included, what the maintenance levels are, and what type of warranty the manufacturer provides. Does it include a dishwasher safe drip-tray, an extra-long sealing bar and built-in safety mechanisms? A majority of countertop models are compatible with vacuum accessories available on the market for sealing jars, containers, big bags and canisters. If you require any of these functionalities, then you should opt for models that include the accessories that you need. Take all the extras into consideration when debating the price point. The other thing to consider is that some countertop models require specially-designed or embossed bags for sealing while other models work well with proprietary bags. It must be noted that using specially designed bags can result in recurring costs, thus making the sealing process more expensive. After going through all the information provided in this article, we hope you will be able to choose the right vacuum sealer for you. Whichever model you opt for, a few things are for certain: with vacuum sealers, your food stays fresh up to five times longer than conventional packaging and you can also save thousands of dollars by opting for wholesale buying. With so many models of vacuum sealers available, you can easily find perfect one.